I have the honor of serv ing on the board of n4a and as their President 2016-2018. My time as President I’ve been able to implement two committees- the Mission Forward Committee and the Dirvistiy Task Force. Both of which I am proud and hope they continue the expansion of the n4a mission and better serve seniors and people with disabilities, and their caregivers. 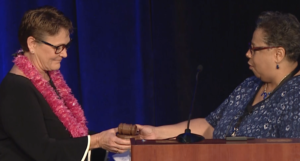 It was my pleasure to pass the gavel to the new President, Debra Stonewalls. ** could use more on what the programs are.